Strap yourselves in for this edition of "I'm feeling blue, so others must hear about it and join in my misery." Heck, the only reason I am making this into a post is because I heard about some post everyday for the month of November. (it has some ridiculous acronym that is beyond my ability to memorize) This being the first day in November, I don't want to necessarily say "yes! doing it!" because.... yeah. That seems like too much a commitment for me to proclaim. But I don't want to be all "darn, I WOULD have, except I missed the first day!" Keeping my options open, people. I am in such an extraordinarily terrible mood. It is most likely an incredibly pitiful meeting of the lunar cycle, "other" impending cycles, and a run of really bad attitudes among the shorties. CANDY! I BLAME IT ALL ON CANDY! It all came to a really explosive pinnacle this morning as I realized that Husband had put the bag of rotted, juicy, old pumpkins that I had originally placed in front of the house for trash pickup, well Husband threw the whole thing in the trash can. And that is the scene I found this morning on the way to deliver the kids to the bus stop- a trash can full, and leaking vile pumpkin muck. I sobbed to myself as I washed it all out in the driveway after the trash collectors had stopped by. And about here is where my words devolve into WAAAAAH, WOE IS ME. But let it be known that I BLOGGED TODAY. I DID. 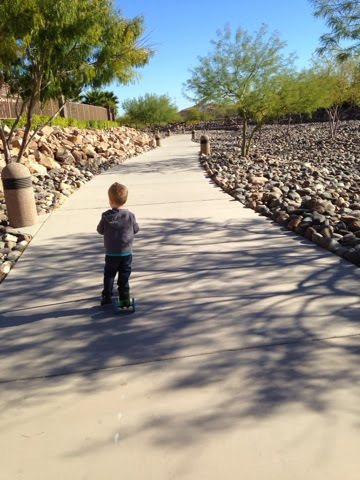 I also took the kid to that park for some scootering. He then went down a slide with a large amount of water at the end and he soaked himself from socks to shirt up the back. So now we're watching the old Batman movie. You know that one, with Adam West. I do love me some Adam West. It has the bonus effect of entrancing the boy until lunchtime. What follows lunchtime, you ask? Why NAPTIME. There is joy left in the world, I tell you.